Ottolenghi is by now a bit of a culinary cliché. I don’t mean that in any bad way – just that it has been so talked and written about that it seems as familiar as soft falling rain. 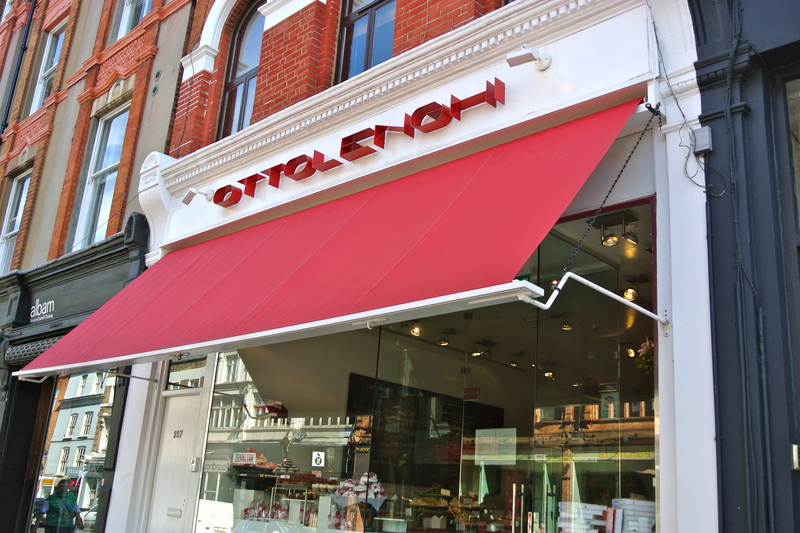 In case you haven’t heard of it, the phenomena that is Ottolenghi is a set of four food shops in central London run by Yotam Ottolenghi and Sami Tamimi. The shops are in Islington, Belgravia, Notting Hill and Kensington; the Islington branch is also a full restaurant, the Belgravia and Notting Hill branches have small communal eating-in areas at the back of the shops and Kensington which is the smallest shop serves take-out food only. I am a fan of Ottolenghi, via their cook books, two of which – Ottolenghi the Cookbook and Plenty are stowed in my kitchen bookcase. But I had never been to any of the Ottolenghi branches so I decided to put this to rights when I was in London earlier in the week and visited Islington’s Upper Street’s Ottolenghi for my morning caffeine fix. 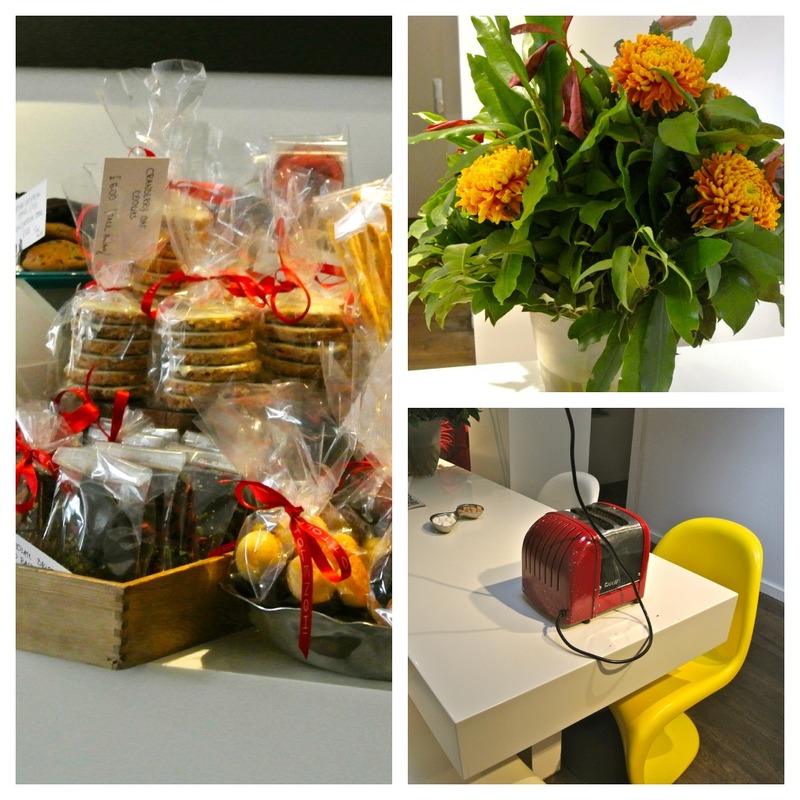 The Islington shop and restaurant is an über cool place where delightful deli meets distinctively designed restaurant. The space is long and narrow with white-painted walls and a planked floor. There are two long white shiny communal tables in the centre of the room and along one wall some smaller tables for those who prefer to dine a deux. All this white could prove monotonous but it doesn’t as there are plenty of enlivening splashes of colour from: flowers; primary coloured chairs; wall decorations; and the massively inviting colourful food displays. 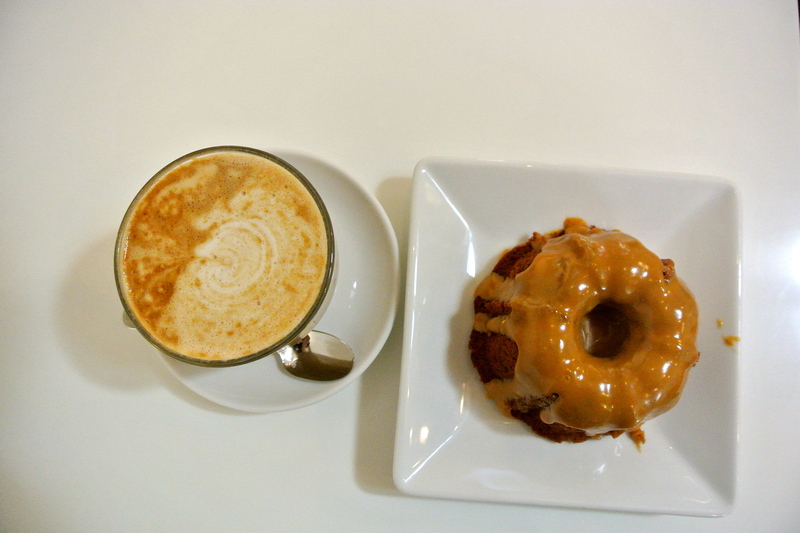 I was in Ottolenghi to have a coffee and the latte I ordered was smooth and flavoursome. 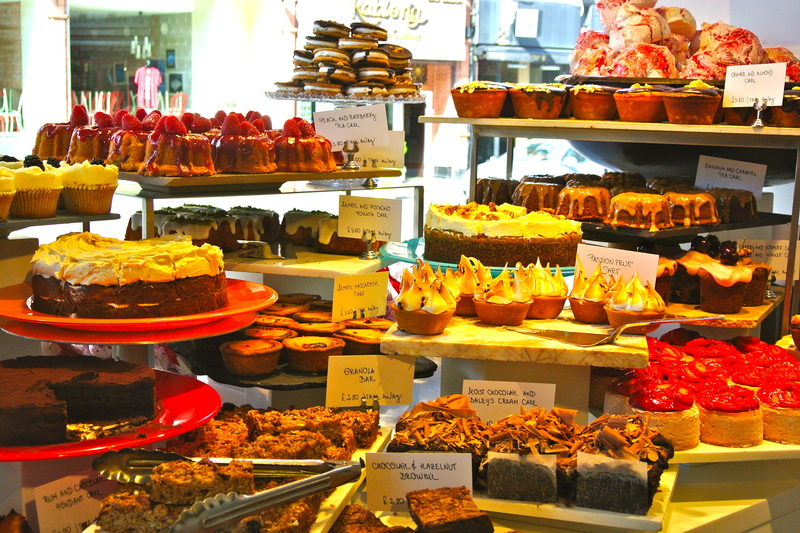 I can as Oscar Wilde said ‘resist anything but temptation’ so having feasted my eyes on the eye watering display of patiserrie I caved in and had some excellent cake. The service was casual-friendly and struck just the right note to chime with the food and the surroundings. I was sorry that I wasn’t able to lunch there as well. Ottolenghi is very much my kind of place. I also like their food philosophy which I found outlined on the Ottolenghi website. 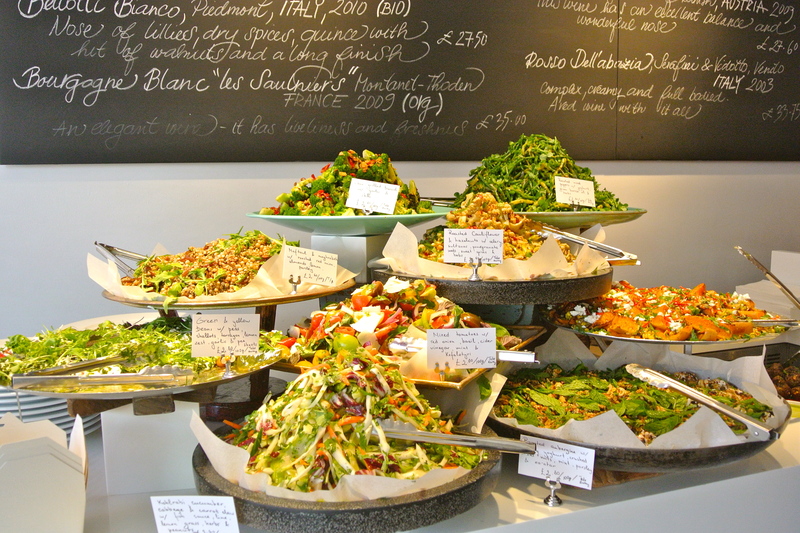 I loved the Ottolenghi on Upper Street and I look forward to going back sometime for a proper lunch. I couldn’t agree more Upper Street is much changed . I would love to visit. What scrumptious-looking food, and I so appreciate their philosophy about food. I am especially taken with their food philosophy – very few cafes/restaurants prepare everything from scratch so it is nice to find one that does. This was so interesting to read, I had no idea there was something other than the cookbooks.. fantastic that you’ve had the chance to actually visit and taste some of their food! That cake looks like it was heaven! And what a display!! Incredible, when you realize it’s all fresh! Next time, take me with you!! The cake was so good – it was difficult to choose because each cake looked nicer than the other, so in the end I picked one of the relatively plain ones. The food displays were magnificent and my rather blurry photos simply do not do them justice. I would love next time to take you with me – who knows! There’s a new Ottolenghi cookbook just published called Jerusalem I don’t know if you have seen it. I have no more space on my kitchen bookcase but no matter I will probably still buy it.